Greg Grandin is the author of Fordlandia, a finalist for the Pulitzer Prize, the National Book Award, and the National Book Critics Circle Award. A Professor of History at New York University, Grandin has published a number of other award-winning books, including Empire's Workshop, The Last Colonial Massacre, and The Blood of Guatemala. Toni Morrison called Grandin's new work, The Empire of Necessity, "compelling, brilliant and necessary." Based on years of research on four continents, the book narrates the history of a slave-ship revolt that inspired Herman Melville's other masterpiece, Benito Cereno. Philip Gourevitch describes it as a "rare book in which the drama of the action and the drama of ideas are equally measured, a work of histor Greg Grandin is the author of Fordlandia, a finalist for the Pulitzer Prize, the National Book Award, and the National Book Critics Circle Award. A Professor of History at New York University, Grandin has published a number of other award-winning books, including Empire's Workshop, The Last Colonial Massacre, and The Blood of Guatemala. Toni Morrison called Grandin's new work, The Empire of Necessity, "compelling, brilliant and necessary." Based on years of research on four continents, the book narrates the history of a slave-ship revolt that inspired Herman Melville's other masterpiece, Benito Cereno. Philip Gourevitch describes it as a "rare book in which the drama of the action and the drama of ideas are equally measured, a work of history and of literary reflection that is as urgent as it is timely." Grandin has served on the United Nations Truth Commission investigating the Guatemalan Civil War and has written for the Los Angeles Times, The Nation, The New Statesman, the Guardian, the London Review of Books, and The New York Times. 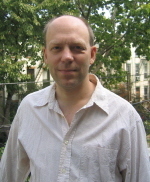 He received his BA from Brooklyn College, CUNY, in 1992 and his PhD from Yale in 1999. He has been a guest on Democracy Now!, The Charlie Rose Show, and the Chris Hayes Show. We’d love your help. Let us know what’s wrong with this preview of The Empire of Necessity by Greg Grandin. What work of non-fiction do you want to read with the group in June 2017?